Does your heart beat faster at the hyphenated words Ducretet-Thomson? Do you yearn for Pathé and Vega? Devoutly wish you had more Boite à Musique BAM? If you answered yes to any of these questions – and if you answered yes to one you’ll probably have answered yes to all three - then you are an avowed admirer of French Classical LPs. And if that’s the case you may very well be interested in this book. Jean-Marc Hirari is a conductor and alumnus of the Paris National Conservatory. As a musicologist his speciality is the French recording industry, which fortunately overlaps his reportorial interest which is French music of the twentieth-century. The core of his book is an LP discography, label by label, followed by an extensive sequence of colour reproductions of LP covers. 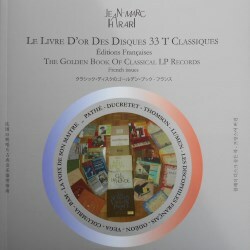 For the avoidance of ambiguity the labels covered are, in alphabetical order; Belvedere Tudor, Boite à Musique, Chant du Monde, Le club Française du disque, Columbia, Cybellia, Decca France, Les Discophiles Français, Ducretet-Thomson, EMI, Erato, Inedits ORTF, L’Oiseau Lyre, Lumen, Odéon, Pacific, Pathé, Phillips, Prétoria, Vega, Versailles and La Voix de son Maitre. That said, the Columbia and La Voix de son Maitre listings exclude discs whose origin is British. Some labels have been excluded so you won’t find anything on Astrée, Callioppe, Valois or Contrepoint. The reasoning is various – either the releases were too recent, which is to say not classic enough, or the prevailing baroque ethos of the labels too prevalent. I’m sure some may carp but it is the editorial line. However a discography of a miscellaneous ‘personal selection’ of other small labels is printed and here you’ll find DMO, Fidelio-Monestier. Iroise, Mouez Brez, Pléiade, Vox-France and their like. As for the sleeve reproduction, there has been no attempt at comprehensiveness but the rarest and most attractive have been covered. To give some indication of what this means in practical terms, there are no fewer than 207 reproductions of probably the most respected French label, Ducretet-Thomson. Each reproduction is rather bigger than postage stamp size – a fraction over 1½” by 1½” - but in almost all cases, despite the relatively small size, the clarity is excellent. That said, something seems to have gone fuzzy on p.210 of the proof copy (Belvédere Tudor is the label) from which I am working, but I should think the reproductions will be clear in the published work. Unless the original LP text was in small font size you’ll usually be able to read the works and the performers, though sometimes squinting is necessary. The alternative is to present larger sized reproductions or to do what, say, Taschen does in its artwork, which is full-page, representative reproductions. But in doing that you will dramatically cut down on the number of LP covers. Given that French pressing runs were not always large and that the artwork was often so creative and forward-looking, it is deeply pleasurable to skim through the pages of reproductions to see the work of such great graphic artists as Jean-Marie Mouron and Maurice Tapiero, who worked for Vega, and their confreres at other labels big and small. The discographies are relatively succinct but somewhat inconsistent. The catalogue number is followed the record size in the case of Boite but in the case of Le Chant du Monde, Ducretet-Thomson and others, a record size heading, say 17cm or 25cm, is then followed by a run of catalogue numbers. Then again in the case of Les Discophiles Francaises, the record size is bracketed page right. These inconsistencies are by no means fatal but they might profitably have been ironed out for ease of use. Following the catalogue number one finds the artist or ensembles that perform. The works performed are sometimes included in full – such as writing Bartók’s Sonata for two pianos and percussion and Contrasts or abbreviated, such as ‘melodies de Roussel, Debussy, Poulenc’. As can be inferred this is an artist-oriented book and there duly follows a sequence of artist discographies. The reasoning for inclusion is not always clear but the artists include such names as violinist Michelle Auclair (including her 78rpm Haydn recording), clarinettist Ulysse Delecluse, pianist Lucette Descaves (including her 78s), fiddler Pierre Doukan, largely forgotten now though he recorded alongside Rampal and Laskine, the much-better known Devy Erlih, whose discs are making a welcome reappearance on CD, and numerous others. Whether such well-known figures as Ferras, Samson François, Navarra and Perlemuter should be here, much less conductors such as Cluytens and Desormieres is a question I think worth asking. And if one is to include most (one or two are missing by my reckoning) of Henry Merckel’s 78s why only include cellist Maurice Maréchal’s LP recordings adding ‘de nombreux 78 tours’. Indeed there is a case to be made for the excision of the artist discographies altogether, interesting though it is to read of them. To take one example: Navarra recorded for a plethora of labels, from Callioppe to Vogue via Electrecord, Saga and Supraphon amongst others. At least half of his discography has no relevance to the labels covered in this book. He too recorded on 78 as a member of the Krettly Quartet, as is noted, but none of the works recorded is listed. The main glory of this book, though, remains its thoroughness and the small-scaled full-colour LP reproductions. The rich variety of the calligraphers’ and designers’ arts can be seen on every page. Whether the labels chose a photographic approach to the artist – Ducretet-Thomson clearly favoured this approach for the photogenic Erlih but favoured photographs of Fauré when they issued Germaine Thyssens Valentin’s still unmatched discs – or whether a more geographical-colouristic approach was taken, as in the glorious cover for Milhaud’s Saudades do Brazil played by Jacques Février, there is enchantment aplenty throughout these pages. So there is much to savour in this book and some things also, it’s true, that could have been reconsidered. On balance however, and despite the price, the dedicated follower of LP records will have a feast with this book but may entertain, if only in passing, the possibly melancholy thought that so many of these discs will never be transferred to CD and will never be uploaded and will never be heard again.